It’s been entertaining to witness various conservative and Republican leaders first dismiss Donald Trump, then scramble to compete and finally stumble as if sucker punched by a bully. And while Donald Trump is frequently called a bully, he has consistently thrown punches that hit their mark and continues to wrack up win after win. That he does this with petty put-downs an half-tuths should come as no surprise because this is the GOP you built over the last 30 years. The roots were put down in talk radio, when the language from fringe Christian radio crossed into the mainstream with Rush Limbaugh. He was given far too much credence, and you stood idly by asking for far too little accountability for the awful things he would say. The anti-politically correct movement started here. Yet being anti-pc is little more than an inarticulate defense for a lack of decency at its best, and veiled bigotry, sexism and racism at its all to frequent worst. The conservative agenda then became further isolated via pusedo news channel, FOX, conditioning your base to distrust just about every body and anything different than they are, via slanted “journalism” based largely on inaccuracies and outright fallacies. 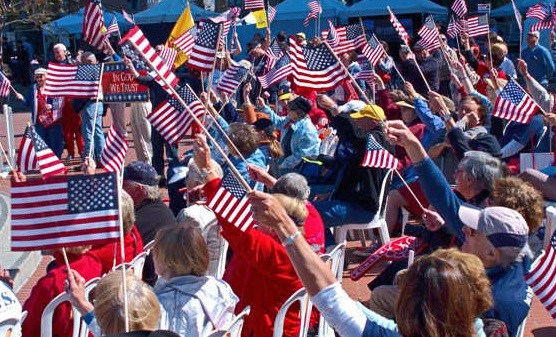 From this echo chamber an emboldened militant wing, The Tea Party, emerged. And then they won more and more seats with extreme and untenable positions leading to congressional gridlock. Because you never reined in your fringes and instead genuflected to them to keep them in the party, a loudmouthed bully is on his way to winning the Republican nomination outright. Shaken out of your stupor too late, you are helpless as your bleating flock, radicalized beyond all control, gravitate to a reality TV show personality who offers a lowest common denominator political philosophy articulated through put-downs, willful ignorance, arrogance and bumper sticker slogans. Ain’t American great? You’re probably going to try and blame this on Obama. Or Hillary, because as much as I love Bernie Sanders, it sure seems likely that Hillary Clinton will be president in 2017. And I’m guessing your party will be in such a shambles that she’ll get two terms. But let’s be clear, there’s no-one to blame this on but yourself. This entry was posted on April 25, 2016 by A.J. Simonsen in Advice and tagged Donald Trump, FOX, GOP, Hillary Clinton, republican, Tea Party.